A land and culture poorly understood by analysts, politicians, and voters in the far-off United States. A regime permeated with corruption; a country in the steel grip of a few families that disdained any system which might give a voice to the millions who kept them in comfort: guarding their children, watering their lawns and putting food on their tables. A brutal and remorseless police force and army trained in America, armed with American guns, and fighting a bloody proxy war against anyone who might conceivably be an American foe—whether or not they held a gun. This was Central America in the 1980s, at a time when El Salvador was the centerpiece of a misguided and ultimately disastrous foreign policy. It resulted in atrocities that took the lives of hundreds of thousands of people and destabilized a region that has not recovered to this day. At a time when the Reagan Administration’s obsession with communism overwhelmed objections to its policies, Ray Bonner took a courageous, unflinching look at just who we were supporting and what the consequences were. 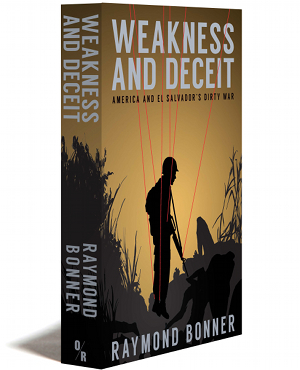 Now supplemented with an epilogue drawing on newly available, once-secret documents that detail the extent of America’s involvement in assassinations, including the infamous murder of three American nuns and a lay missionary in 1980, Weakness and Deceit is a classic, riveting and ultimately tragic account of foreign policy gone terribly wrong. El Salvador is a tiny nation, with a population under five million. No larger than New Jersey. Go up in a helicopter, and at 9,000 feet you can see the entire country, as Ambassador Robert White was fond of saying. Yet in the 1980s, El Salvador was at the top of list of Washington’s foreign policy concerns and fears in a way that Iraq, Iran, Syria are today. Include neighboring Nicaragua, where in the Reagan Era a Marxist-led revolution had recently overthrown the decades-old, American-backed Somoza dictatorship, and the combined population of the countries concerned was under eight million, their total territory one-third that of Iraq. Obsessed by the “domino theory,” after the “loss” of Nicaragua, Washington was determined that El Salvador should not be next. The “-ism” feared then was not Islamism or jihadism. It was Communism. But there are parallels. Then, as now, there was brutality and butchery. ISIS beheads journalists, aid workers, Christians, and Muslims from other sects. In El Salvador it was the American-backed government and its henchmen that murdered a Roman Catholic archbishop, American nuns, Dutch journalists, Jesuit priests, aid workers, and political leaders who challenged the government. Government “death squads” seized students, tied their thumbs behind their back, shot them in the head, and left their bodies beside the road or behind shopping malls. Soldiers with automatic rifles cut down students and workers who dared demonstrate for democracy, and peasants as they forded rivers to flee the civil war, or who were considered the enemy because they lived in guerrilla-held areas of the country. And just as senior American officials “dissembled” to take us to war in Iraq, so, too, American officials routinely “dissembled” about events in El Salvador, about who killed the nuns, who was responsible for the violence, about the government’s horrific human rights violations. The deceit was necessary to maintain congressional and public support for American involvement in the tiny country. Disproportionate to its size, El Salvador has played a major role in American foreign policy, a bridge between Vietnam and Iraq. As the Reagan Administration increased military aid and sent military advisors to El Salvador, administration officials sought to assure Congress and the American public that we were not wading into another Vietnam, and supporters of the policy saw El Salvador as the place we could rid ourselves of the collective doubt brought on by the defeat in Vietnam. The “violence” – a nice euphemism for torture and killing – we have recently come to associate with Abu Ghraib and American interrogation of suspected terrorists in the CIA’s secret prisons has antecedents in El Salvador. An illegal, inhumane and immoral form of warfare was waged with the knowledge and support of American officials and diplomats, but hidden from the American public. Consider this cable sent by the American embassy in San Salvador in June 1982. The subject was simply “Torture.” It describes the ordeal of a forty-year old school teacher, a father of four, who devoted his free time to helping with the Salvadoran Green Cross, delivering food and medicines to refugees, tens of thousands of whom had been created by the civil war. He was seized as he was leaving the elementary school where he taught, blindfolded, his thumbs tied behind his back (standard operating procedure for the Salvadoran military at the time). He was taken to National Police headquarters in downtown San Salvador where he was interrogated and tortured in a “six-room soundproof suite of torture chambers,” the embassy reported to Washington. The man told the embassy political officer, who knew him well, that the “torture rapidly broke his psychological resistance” (which is, of course, what the architects of the torture techniques used on terrorist suspects sought to do), and he signed a “confession” (just as many terrorist suspects being held at the secret prisons confessed to knowledge of terrorist plots in order to stop the torture). “We have no reason to doubt his story,” the embassy wrote in the cable. But the American government went out of its way to insure that the American public did not know about the atrocities committed by the American-back government in El Salvador, which had become the third largest recipient of American aid – after Egypt and Israel. The cable, sent in June of 1982, was classified “NoDis,” which is above “secret,” and means it was not to be distributed outside the upper levels of the State Department, CIA, NSC. Most documents pertaining to El Salvador and Central America in those years were over-classified because the policy was highly contentious, with strong opposition in Congress as well as the public, and the Administrations – Carter, Reagan, Bush – did not want leaks to congressmen or reporters. In 1993, some 12,000 pages were declassified and released. Of all those documents that have now come to light, perhaps the most remarkable is a lengthy highly-classified cable written by Ambassador Robert White in March of 1980, at the beginning of what was to be a decades long civil war. Subject: “Preliminary Assessment of the Situation.” It was classified “NoDis,” and only fifteen copies were made, which is a tragedy. It was not shared with Congress. 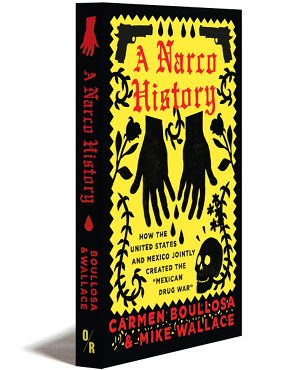 There should have been 1,500, or 15,000, copies made, because the debate, in Congress and the public, about American aims and methods in El Salvador and Central America would have been better informed had White’s analysis been part of it. Since its declassification and release in 1993, the cable has been largely overlooked, just as the American wars in Central America have faded into history, replaced by the nationalist upheavals in the Balkans and now by revolutions and turmoil in the Middle East. But White’s twenty-seven-page cable deserves to be accorded the same place and importance in history as George Kennan’s legendary “long telegram,” which analyzed the political landscape in the Soviet Union in 1946 and proposed the containment policy that was to guide the United States during the Cold War. “The principal enemy of a moderate solution is the ultra-right and its allies within the [military] high command who are permitting the current campaign of torture and murder to continue.” But White’s timely warning was ignored, and more torture and murder would follow. One of the key players in revolutionary El Salvador was Archbishop Óscar Arnulfo Romero, “a symbol of better life to the poor,” White noted. “The most serious threat to a moderate solution would be the assassination, whether by the ultra-left or by the ultra-right of Archbishop Romero.” He was sadly prescient. Five days later, the “ultra-right” assassinated Romero while he was saying a mass, and in the civil war that followed, more than 75,000 Salvadorans paid with their lives.